Fujifilm has long been recognized as a leading supplier of high-performance, high-reliability video tape and other media to broadcasters and production houses around the world. In 2008, Fujifilm introduced the R-series memory cards for the Panasonic P2 system and now introduces the new F-series P2 memory cards. The F-series was created to offer users a lower cost media option, a higher transfer rate and the same high-capacity level as that of current models. Fujifilm's P2 cards come in 16 GB, 32 GB and 64 GB capacities. A single 64 GB card is capable of recording about 128 minutes of HD data. * The F-series can offer an impressive maximum transfer rate of 1.2 Gbps when used with compatible hardware, made possibly by newly developed high-speed memory controller. Because the fujifilm P2 cards are compliant with general PC card specifications, they can be used to read and write data to a PC by plugging it into the PC card slot. 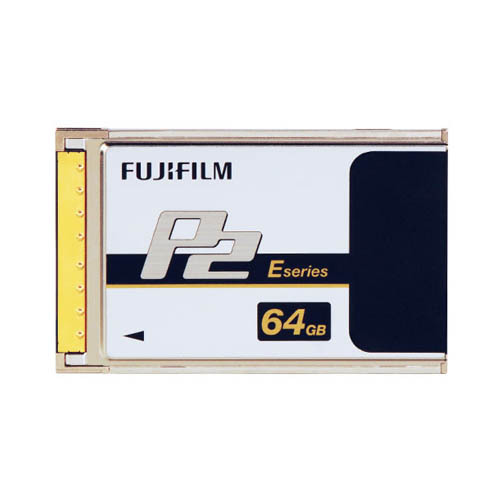 Additionally, the memory card can store content in a complete range of P2 supported frame rates and formats, from high definition to standard definition and from DVCPRO to AVC-Intra 100. *When used with laptop and desktop PC, P2 card driver (Panasonic product) must be installed. Shooting in extreme environments can be plagued with problems like condensation from severe temperature changes, vibration or shock. Our P2 cards utilize all the inherent advantages of solid-state memory to protect your quality footage and video work from vibration and shock. Fujifilm P2 cards can be operated in temperatures from -20°C to 60°C and stored at temperatures between -40°C and 80°C. These are true quality specifications developed specifically for professionals who require the utmost in reliability. The connectors, which have passed 30,000-cycle insertion and removal tests, are ruggedly built to withstand repetitive use.